I’m posting here a letter e-mailed by Tim Eyman on the heels of the loss on Initiative 1125, which would have restricted how highway tolls can be used. He first makes the case that initiatives are hard, in large part because you have to judge months ahead what the electorate will support. That much probably everyone would more or less agree with. At least one of his other comments is worth wondering about in connection with local issues. So this makes me wonder about the vets and homeless levy that failed in a big way here in Kitsap County. It’s not similar to an initiative in how it was launched. This was not a grass roots initiative in which a number of voters gathered signatures. This was launched by government. But could the silver lining for the levy’s supporters be that the issue was raised at all? Sure, the measure lost big time. But people are talking about it. Is there any chance the needs supporters identified will be met some other way? Isn't this the sticker we used to get? This one downplays your benevolence. Time was when you voted you went to an actual polling place and punched holes into a piece of paper, or a butterfly ballot, and when you walked out of there you left with something that let you puff your chest a little. It was that old sticker with the American flag and the “I voted” slogan in 182-point font. I like the looks of the stickers we get now for getting out of our cars on election day and actually walking into the library. But, c’mon! What’s the point of wearing an election day sticker if it doesn’t give you moral superiority over your friends and fellow shoppers at Value Village? Maybe it’s just me. That’s why I’m putting the question out there. On election day, if you’re one of those who puts off voting until the last minute and you drop your ballot off somewhere they’re handing out stickers, are you like me? Are you disappointed that the sticker you get understates your contribution to America? If I had my way we would get hats and bumper stickers and T-shirts. I want a sign that says “I’m the 47 percent” to show that I’m among those who care enough about our country to pretend our vote matters. So take your pick. 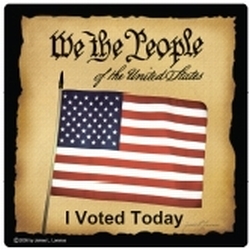 You like the old “I voted” sticker, or the new one? Tristan Baurick is writing a story on the changed political sign culture on Bainbridge Island. I’ve got a sign story of my own to tell. On Aug. 29 Kitsap County commissioner candidate Chris Tibbs sent a letter to Doug Ellis, interim executive director at the state’s Public Disclosure Commission, and to Sam Reed, secretary of state, about a call made to a vendor of his. Tibbs, a Republican, said that Dennis Peterson, owner of Kitsap Sign Co., told him Linda Gabriel, campaign manager for Rob Gelder, a Democrat running for the seat he was appointed to earlier this year, called Peterson’s business identifying herself as Tibbs’ campaign manager and asking to see paid invoices. Gabriel has since said of Peterson’s contention, “If he told him that, he either was mistaken or not telling the truth, but I never said that to him.” Peterson himself has since said he thought that is what she said, but he may have not heard it correctly. Gabriel had planned to have campaign volunteers go look at the invoices, she said, because Tibbs had not yet posted them with the commission, and there seemed to be far too many signs out there for the receipts that had been recorded. 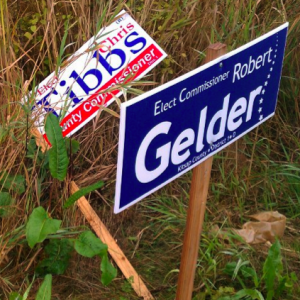 Tibbs has been, in his words, “aggressive” in getting lots of signs out there. She would have been entitled to go look. Vendors are required to show the paperwork they create when it involves campaigns for public office. Gabriel didn’t send someone, because the receipts were then posted on the PDC site before that was necessary. That vendors are required to show that info was news to Peterson, because he had never been asked. That’s not surprising, because normally the records are readily available online before it gets to going to vendors. In this case they were not, according to Gabriel. Personally, I think either Peterson misheard Gabriel, or Gabriel misspoke without realizing it. She said it would be stupid for her, someone who was readily identified as the campaign manager for one candidate, to try to sneak one by a vendor by claiming to be the campaign manager for someone else. I agree. That would be stupid. It’s not out of the realm of possibility that someone from a campaign might try to pull a fast one, but not something so easy to disprove and not for something she was entitled to see anyway. What further makes me think it was an honest mistake by someone is that Peterson, when I talked to him on the phone, didn’t know who Gelder was. He knew Tibbs, since he’d printed the signs for him. I don’t think Peterson was lying. I think he thought Gabriel said something she did not. One thing Gabriel and Peterson agree on was that neither liked how they were being treated on that phone call between each other. A lot of what burns campaign workers at election time is what happens to their signs. Every year, since 2004 anyway, we reporters are asked to look into what campaign workers allege is vandalism to campaign signs. In 2004 there was clear targeting of many George Bush signs. Some of John Kerry’s signs were abused, but it did seem that Bush signs were trashed in far greater numbers. Since that election I have heard complaints every year, mostly from Republicans. James Olsen on Bainbridge Island has consistently created a list of the destruction to his signs on Bainbridge Island. On Monday I spoke with Jim Sommerhauser, who until this year could be seen every election planting campaign signs for the Democratic Party. Sommerhauser said a campaign can count on losing about half of its signs during a campaign. The vast majority of those losses, he said, are caused by what he described as “kids” going after an easy target. He said most of it is not really aimed at a candidate for reasons other than availability, but sometimes kids respond to their parents’ open opinions about candidates by acting out in ways an adult would not. About 10 percent of the vandalism, he said, is intentional. Another cause is when candidates don’t know the rules about where signs can go. State right of way is off limits. County right of way is fine for the smaller signs in most of the county, as long as they’re not put on mowed areas or have the wire holders. On Bainbridge Island the property owner next to the county right of way must be notified. In Bremerton and Port Orchard signs are not allowed on public right of way, period. All this is according to a rule sheet Sommerhauser hands out to other Democrats. Sommerhauser, on that same sheet, advises how to place signs to reduce vandalism, but also makes the case to not overdo them. He says candidates should not try to “outsign” opponents, and that a sign in someone’s yard carries endorsement value a sign along a random point in the road does not. Tibbs has tried to outsign Gelder, and for the most part he’s done it. You see one Tibbs sign, you might see six. There is also good evidence to support that Tibbs signs are being pulled and dumped on the ground in greater numbers than anyone else’s. The picture above comes from Tibbs’ Facebook site. The site isn’t dedicated to sign vandalism, it’s for his campaign, but he did post some pictures. Law enforcement has not generally placed a high priority on policing this stuff when they hear about it. It’s not that they don’t respond to calls, but I haven’t heard of too many people being caught. I’d like to see someone vandalizing a sign just so I could get to the motive. Sometimes the vandals are doing it in public enough that another citizen will notice. Here is an audio recording of a woman’s call to 911 when she saw someone dumping signs. Tibbs provided the audio here and showed me the police report. That report shows several signs on the ground. They all belong to Tibbs. Other signs, for Bremerton City Council candidate Faye Flemister are left standing. The two theories are that his signs are being targeted either because he is a Republican, or because there are so many of his signs out there, way more than anyone else. I’m guessing some of you have an opinion about that. Today, I checked into a possible snafu with ballot postage that turned out to be a non-issue. We got an email from someone who said the post office told him the ballot he was trying to mail required an additional stamp. The problem appears to be an anomaly. 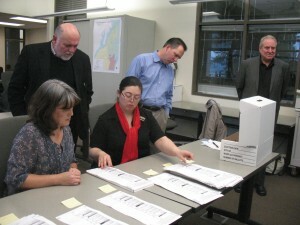 Elections manager Dolores Gilmore said that ballots properly returned would only require a single stamp. In fact, her office has received an estimated 10,000 ballots since they were mailed out last week. The single stamp seems to be working just fine, she said. Gilmore said even if a person forgot to tear off the tab on the ballot, the extra weight would not put the envelope over the 1 ounce limit (for a single stamp). This election requires a 2-column ballot. Some elections require a 3-column ballot, which would be above one ounce, Gilmore said. Gilmore speculated that if one were to mail a flier included with the ballot stating voter instructions and notice of ballot drop-box locations, and if the voter failed to tear off the tab (which is supposed to be removed), the weight might exceed one ounce. If you want to save yourself a stamp, 24-hour ballot deposit boxes are available until 8 p.m. Nov. 8, election day, at the Poulsbo Fire Station, 911 NE Liberty Road, Poulsbo; and at the Kitsap County Administration Building, 619 Division Street (corner of Division and Cline) in Port Orchard. The Kitsap County Auditor’s election division is open 8 a.m. to 5 p.m. Monday through Friday, and from 7 a.m. to 8 p.m. on election day.